Various sizes and brands of sterilization pouches. All pouches are transparent for easy viewing and are compatible for EO gas/steam sterilization. Sold 200 per box. 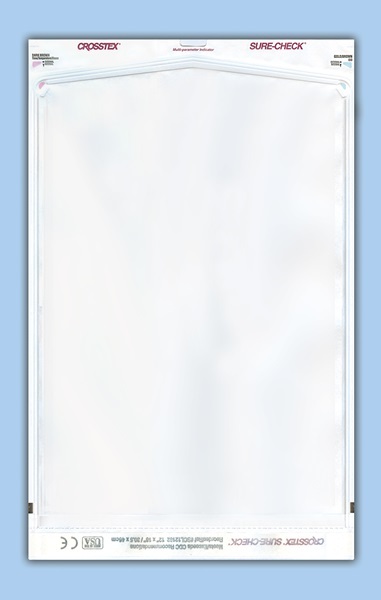 5.25" x 10" Ster-All self-seal sterilization pouch is transparent blue in color. This self-sealing pouch is made from a paper/film material and contains a thumb notch at the fold, making it easy to open and grip. Perforated edge helps to ensure a quality seal. Made of a polypropylene/polyester blend and medical grade paper. Latex-free. 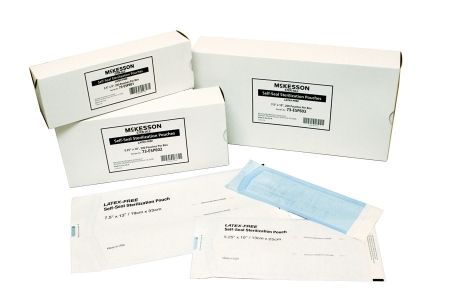 12" x 18" McKesson Argent Sure-Check self-seal sterilization pouch is transparent blue. This self-sealing pouch is made from a paper/film material and helps to ensure infection prevention through proper instrument sterilization, facilitating the safety of both patients and medical staff. Triple seals trap heat along the secured edges to prevent separation. Sterilization pouches maintain sterilization integrity through extra-wide chevron seals. Includes Class 4 or Multi-Parameter Sterilization indicators to help ensure proper saturating steam presence, exposure time, and sufficient high temperatures. Wide self-seal strip and thumb notch make it easy to open. Medical-grade paper eases the labeling process; clear transparent film provides aseptic presentation and easy identification of surgical equipment. 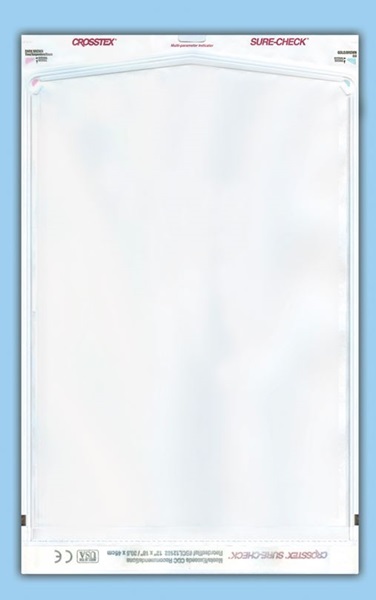 3.5" x 8" Steriking sterilization pouch is transparent white in color. This self-sealing pouch is made from a paper/film material. Feature the innovative and convenient chemical indicator (Class 1) peel-off strip. The sterilizable adhesive strip promotes a tight, impermeable closing of the pack, while the closing flap is prefolded to facilitate the sealing of the pouch. 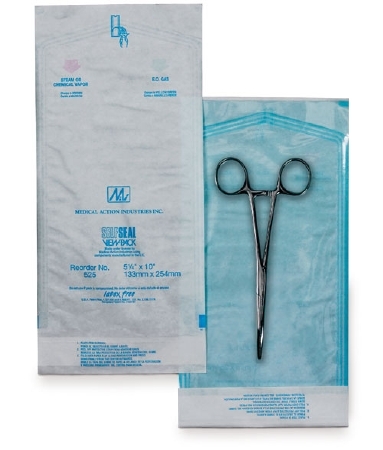 3.5" x 9" Ster-All sterilization pouch is made from a blue paper/film material. Thumb notch at the fold makes it easy to open and grip. Perforated edge helps to ensure a quality seal. Made of a polypropylene/polyester blend and medical grade paper. Latex-free. 3.5" x 9" Sure-Check sterilization pouch. This self-sealing pouch is made from a film material with built-in internal/external multi-parameter steam sterilization indicators to confirm all sterilization criteria—time, temperature, and presence of steam. Eliminates the extra step of adding separate multi-parameter indicators to each pouch and meets CDC infection control guidelines for effective sterilization. 3.5" x 9" Medline sterilization pouch. Transparent blue and self-sealing. 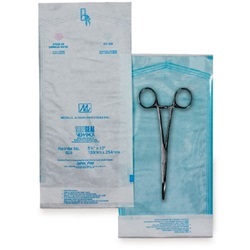 7.5" x 13" McKesson Argent Sure-Check self-seal sterilization pouch is transparent blue. This self-sealing pouch is made from a paper/film material and helps to ensure infection prevention through proper instrument sterilization, facilitating the safety of both patients and medical staff. Triple seals trap heat along the secured edges to prevent separation. Sterilization pouches maintain sterilization integrity through extra-wide chevron seals. Includes Class 4 or Multi-Parameter Sterilization indicators to help ensure proper saturating steam presence, exposure time, and sufficient high temperatures. Wide self-seal strip and thumb notch make it easy to open. Medical-grade paper eases the labeling process; clear transparent film provides aseptic presentation and easy identification of surgical equipment. 3.5" x 5.25" Sure-Check sterilization pouch with built-in internal/external multi-parameter steam sterilization indicators confirm all sterilization criteria—time, temperature, and presence of steam. Eliminates the extra step of adding separate multi-parameter indicators to each pouch. Meets CDC infection control guidelines for effective sterilization. 3.5" x 9" View Pack sterilization pouch. Transparent blue and self-sealing. Patented triple seal provides an adhesive-to-adhesive, adhesive-to-paper, and adhesive-to-poly closure for a secure, tamper-free barrier. Triple rail seal offers protection exceeding that of one wide seal, resists blowouts, and provides uniform peel when opening. Blue-tinted laminate helps to quickly detect if a hole or tear is present, and highest quality medical grade paper helps prevent fiber tear of the packaging.